Yesterday I took a break from working on card orders and put together a few wintery green arrangements for our outdoor planters. It was such a relaxing treat that I know I need to do more of those type of breaks during this crazy busy time. 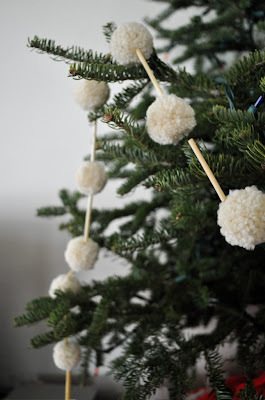 How lovely is this tree garland? This is on my to do list for a few more breaks before we get the tree early next week. I don't think I've ever seen the wooden straws but, they really are perfect for this. Head on over to Elsie Marley's blog to get the full tutorial.